The Uni-Versal™ Eddy Current Testing Machine is an advanced flexible platform for non-destructive inspection services for real world applications. While there are different NDT methods available, our eddy current inspection machines provide definitive results in seconds for making qualified decisions. There is no single eddy current testing system that can perform the nondestructive examination (NDE) or condition monitoring for structural integrity of metal components. Salem Design & Manufacturing utilizes a number of systems that range in various sizes and energies. 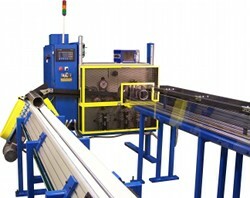 This allows us to provide custom turnkey solutions for integrated material handling that includes robotics and servo controlled manipulators at a competitive price. 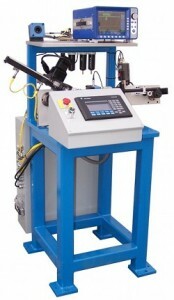 This is a flexible eddy current inspection machine for inspecting parts for cracks and flaws. A robot is used to position the part and a second robot moves the eddy current probe over the surface to be inspected. Since all motions are programmable, many different parts can be inspected with minimal changeover required. Using a robot to pick and return accepted parts to the conveyor, this machine tests automotive spindles for cracks on their outside surfaces using eddy currents. Two servo-controlled eddy current probes scan the surfaces of the part. Rejected parts are placed on a reject conveyor. 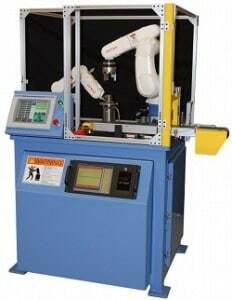 This system uses a robot to pick up rings from two inlet tracks and place them in a test fixture where the OD and ID of the rings are eddy current inspected for cracks. Parts are segregated with accepted parts put back on the conveyor they arrived on. Two different part types are processed by the machine interchangeably. 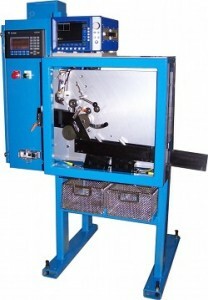 This machine inspects slugs cut from tubing for cracks on their OD and ID and then checks them dimension-ally for ID, OD, wall thickness, and squareness. A V-conveyor is hand loaded and good parts are segregated from bad on exit rails. 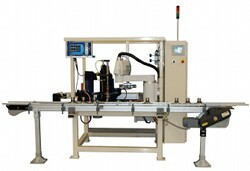 The machine changes to test a variety of OD and wall thicknesses through the programmable servo controlled motions. 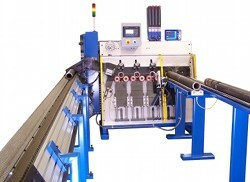 This machine inspects machined rings for cracks on their OD and ID. A V-conveyor is hand loaded and good parts are segregated from bad on exit rails. 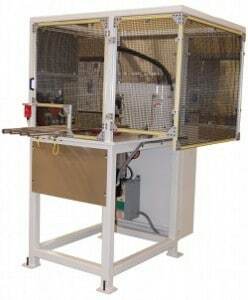 The machine changes to test a variety of OD and wall thicknesses through the programmable servo-controlled motions. This machine inspects hardened rollers for heat treat characteristics utilizing eddy current technology. Parts are processed as they leave a centerless grinder, the part passed through an encircling coil and reject parts are removed. The processing speed is over 6 parts per second. This machine inspects the ID and OD of a spherical CV joint cage. The cage is clamped and rotated as the eddy current probes are programmed to pass over the surfaces. Different part geometries may be processed. The accepted parts leave the machine, and rejected ID and OD parts are segregated. At Salem Design & Manufacturing, we’ve built a foundation of quality craftsmanship by placing a premium on exceptional service. It’s an inner strength and outward focus that makes Salem NDT the smart choice for non destructive testing machines. Built to last, designed to stand out, and backed by a customer-first culture.